This project proposes a game changing technology for conversion of solar energy to liquid fuels. Both solar heat and solar PV electricity will be used to drive a solid oxide electrolyser device for a production of hydrogen and syngas which then can be converted onsite into transportable liquid fuels enabling large-scale energy export and storage. 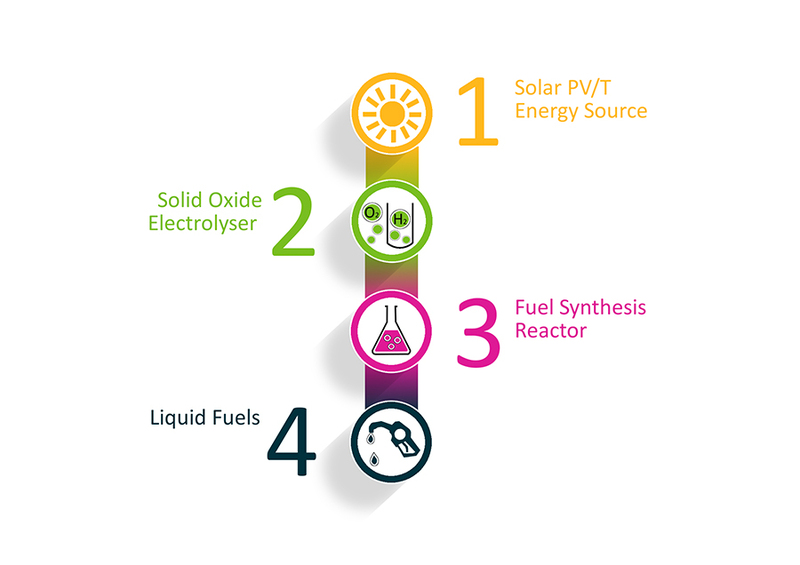 The project aims to deliver a solar powered solid oxide electrolyser (proof of concept device) for a low cost hydrogen or syngas production at unprecedented efficiencies along with a matched catalytic process to synthesize transportable liquid fuels in an economically feasible and environmentally friendly manner. In this context, proposed technology provides far more practical and economical solution for renewable energy export. The project will be delivered by CSIRO led consortium with RayGen Resources, ADME fuels Ltd., Ben Gurion University at Negev in Israel, Johnson Matthey in UK, and Northwestern University in USA. The proposed project is a collaborative R&D by the reputed organisations along with well established industry. CSIRO will put nanotechnology and innovative ceramic engineering processes to work and develop robust all ceramic electrolyser cells. The consortium will work holistically to provide revolutionary solution for energy storage and export; from an optimised solar energy source to a ready for integration catalytic process to produce high quality directly usable liquid fuels. A key benefit of the proposed technology is up to 40% direct savings in electricity required for electrolysis process. The process will also use waste CO2 emitted from numerous industrial processes, to produce premium fuels for energy export. Fully developed integrated system will provide a practical yet economical and environmentally friendly solution for hydrogen production and its conversion into transportable liquid fuels. Up to 8 tons of CO2 is projected to be removed every hour for 70 MW scale plant.